Spring is here, and that means the annual return of many things: flowers and birds; sunshine and garden words; foliage and flowers; and fish—lots of fish. Check you local streams in the spring, the fish might be running! The annual arrival of migratory fish to Maine’s coastal rivers, this Rite of Spring, makes this place special. Twelve species of migratory (sea-run or diadromous) fish are native to the Northeastern U.S., but Maine is the only place where all of them still exist in countable, and in some cases fishable, numbers. 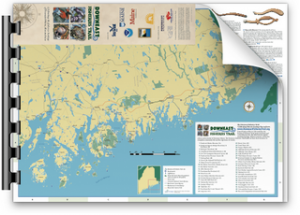 Thus Maine is the last refuge for wild Atlantic salmon, and hosts the largest remaining populations of sea-run brook trout, rainbow smelt, alewives, and blueback herring. These last two are harvested by communities, sold mostly for lobster bait, with the profits going toward local schools and other municipal services. The alewife fishery has served as an incentive for towns to restore alewife waters by fixing fish ladders, removing defunct dams, and upgrading culverts—efforts that also benefit other fish and wildlife like bald eagles, osprey, and otters. 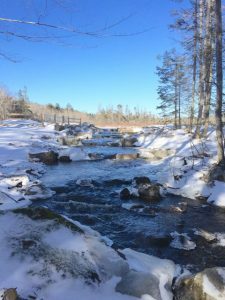 It’s hard to really comprehend the volume of fish that once filled Maine’s bays and rivers—seeing really is believing, and today the best way to grasp the magnitude is to visit a publicly accessible alewife run during the month of May. Here’s a list of such places along the Trail, along with celebrations scheduled to coincide with fish runs. Somesville Mill Pond. Restoration of the Somes Pond fish run continues, led by the Somesville-Meynell Wildlife Sanctuary. Cherryfield Cable Pool. This park on the Narraguagus River was once a world-famous fishing pool for Atlantic salmon, a species now listed as endangered. Salmon persist in the river, but anglers now fish for American shad from this same spot. Pleasant River Hatchery. Downeast Salmon Federation hosts the Annual Smelt Fry (on April 21 in 2018), one of many World Fish Migration Day events around the world. Peter Gray Hatchery. With its numerous lakes, the East Machias River watershed is prime alewife territory. Visit the wild salmon hatchery, and take a stroll along the river, where wildlife abound. There’s no better time to check out your local river or stream. The fish are running or will be soon—go and find them!